This is a round up of the first talk I did called “No metas todo en la misma bolsa: generando bundles por dispositivo” (which could be translated to the title of this article). tl;dr; the idea is to incrementally start serving particular experiences for each device (i.e: Mobile / Desktop) in the lazy programming way. In this post, I’ll give a background about the problem to be solved and the first attempt to do it. Although, the post will talk about a concrete feature, I won’t be showing too much code, the following posts will have working examples. As every developer knows, problems are created by the product team. We’ve started having UI requirements that were too specific for each device. Some of these often involved using libraries which only target that device (e.g. : drag & drop capabilities were only needed on desktop, not mobile). Bundle size started to rise, code started to get dirty and differences between devices got worse and worse. At the time, the PWA team was a small team (only ~5 devs), we just could fork the platform and treat each device as a particular development. In addition, we had a working product, we needed to make changes incrementally. Although many teams may have this problem, the developed solution isn’t a silver bullet. It addressed our particular constraints and characteristics. In this post, my objective is to give some insights about the process of how that solution has been reached. First of all, i’ll have to do a brief introduction about the stack in which the platform is developed. The PWA uses the usual React+Redux+React router stack bundled with webpack. The server code is transpiled with babel in order to re use react component to do server side rendering. Backends are external microservices. The PWA’s server has a proxy in order to communicate with them. As i’ve said before, the idea was to start optimizing the platform for each device. Separate Sites: Developing a fork for each device. This would involve to start moving common code to packages or something similar in order to avoid code duplication. Dynamic Serving: Serving different content (js, css bundles) depending on the requests headers (mainly the UserAgent). The problem of this approach is to investigate a way of building the different bundles without having to do radical changes on the current code. Client received the web duplicated, both mobile and desktop components. We want to reduce initial learning curve for developers (easy developer’s transition) and the long term maintaining effort. As far as the separate sites approach, we should fork the current codebase and maintain different codebases (a huge long term maintaining effort) or refactor the current codebase in order to extract all the common code and then fork (hard transition, as developers should understand how to write the common code in order to share it between forks). So, this approach was a no op. The company already had a DeviceAtlas contract, so it was an easy choice. DeviceAtlas is a device detection solution for parsing User Agent strings in the web environment, so it was just what we needed. The following problem was building device specific bundles without having to make huge changes on the way developer’s work. The idea was trying to resolve everything on compile time, so we don’t get any runtime penalties while also having a easy developer experience. 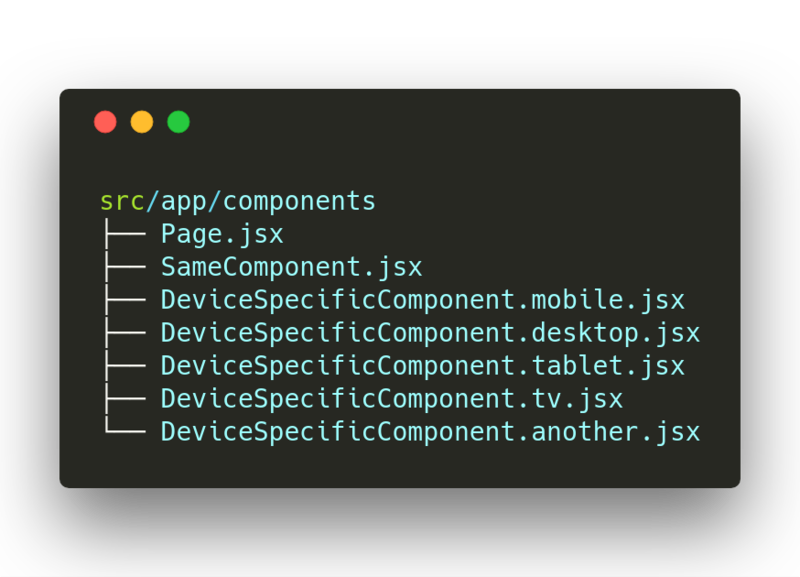 And for each device bundle, it would resolve to the appropriate file (ie: DeviceSpecificComponent.mobile.js for the mobile bundle, DeviceSpecificComponent.desktop.js for the desktop one, and so on). 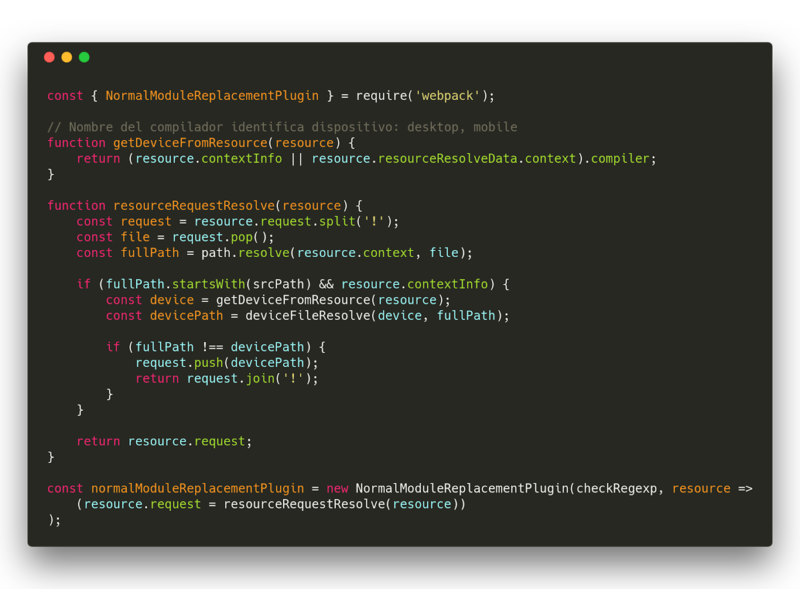 Luckily, Webpack has a plugin called NormalModuleReplacementPlugin which allows to change the resource resolution. But, in order to build a bundle for each device using this approach, it requires to make a compilation for each device. To address this issue, webpack has the multi-compiler feature. two builds for each device, one build for the node server ssr and another one for the browser. the developer doesn’t have to think about what device he/she is targeting, only include the component and write the device specific implementation (using the file naming convention). In the next post in this series, i will talk about how can all the boilerplate to implement this feature can be abstracted into a razzle plugin. There will be more concise examples with working code!